Fall is definitely one of my favorite times of the year, and it’s mostly due to the fact that Thanksgiving lands in fall. It’s by far one of my favorite holidays. With fresh roast turkey and creamy mashed potatoes, green bean casserole and freshly baked rolls, it’s a holiday all about family, food and giving thanks. 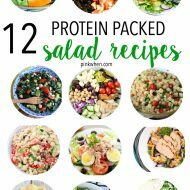 It’s a special time of the year where we can keep it simple in the kitchen and stick to the classics or amp it up and try something new. 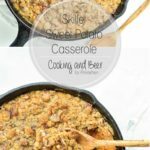 I start recipe testing for Thanksgiving in September, and this isn’t just because I run a food blog where I have to recipe test early on in the season. It’s really because I’m always looking for ways to put fun spins on my favorite classic Thanksgiving recipes. I’m definitely all about the classics, but amping them up is one of my favorite parts about the holiday. 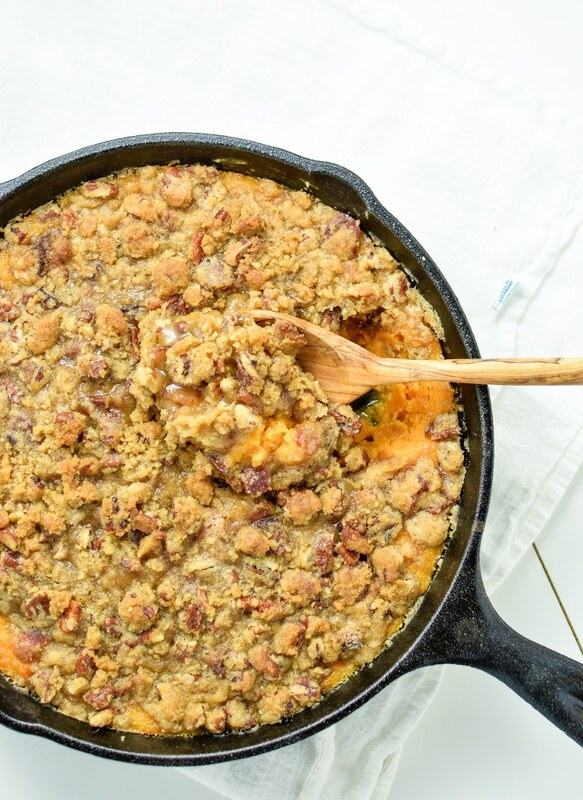 This skillet sweet potato casserole with bacon, brown sugar crumble isn’t your everyday sweet potato casserole. There are no marshmallows on top (even though I adore marshmallows on my sweet potato casserole), and it’s baked in a cast iron skillet instead of a large baking dish. Savory bacon tones down the sweetness and this skillet of deliciousness is ready in under an hour…something I find to be most necessary when I’m scrambling around the kitchen. This dish is all about keeping it fun, yet simple, without spending days in the kitchen. 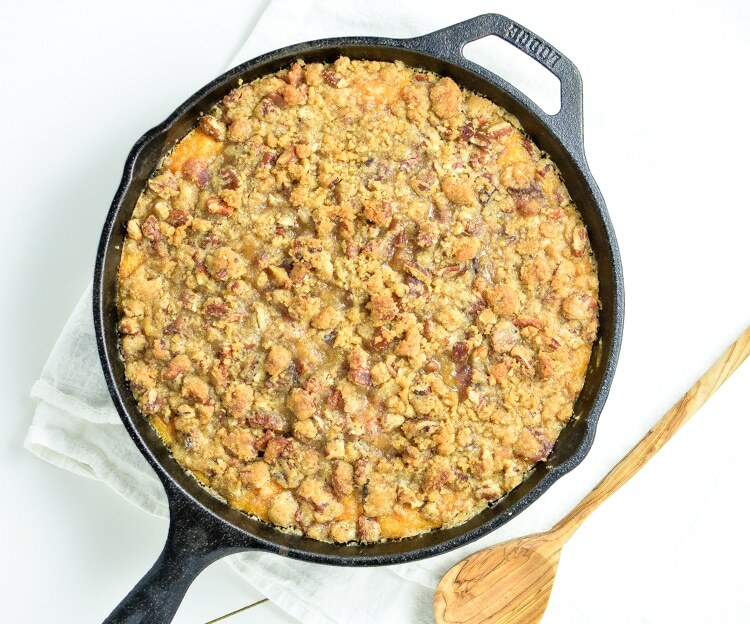 Recipe for this sweet potato casserole with bacon, brown sugar crumble is below! This one is keeper! Perfect for Thanksgiving, or just because, this sweet potato casserole is DELISH! Preheat your oven to 350 degrees F and have a cast iron skillet or oven-safe baking dish ready. Place the cubed sweet potatoes in a large pot and cover with water. 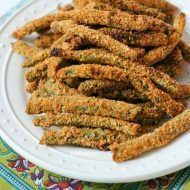 Bring them to a boil over high heat and cook until tender, about 10-15 minutes. Remove from heat and drain. Transfer to a large bowl and mash. To the bowl with mashed sweet potatoes, stir in 1/2 cup of the melted butter, heavy cream, 1/4 cup of the brown sugar, and the salt until fully incorporated. Pour the mixture into the cast iron skillet. In a medium bowl, combine the 1/3 cup melted butter, 1/2 cup brown sugar, flour, pecans, and bacon. Fold the ingredients together until moist crumbles form. Sprinkle the mixture on top of the sweet potato mash. Place the skillet in the oven and bake for 35 minutes or until golden brown. Remove from heat and let stand for 5 minutes before serving. 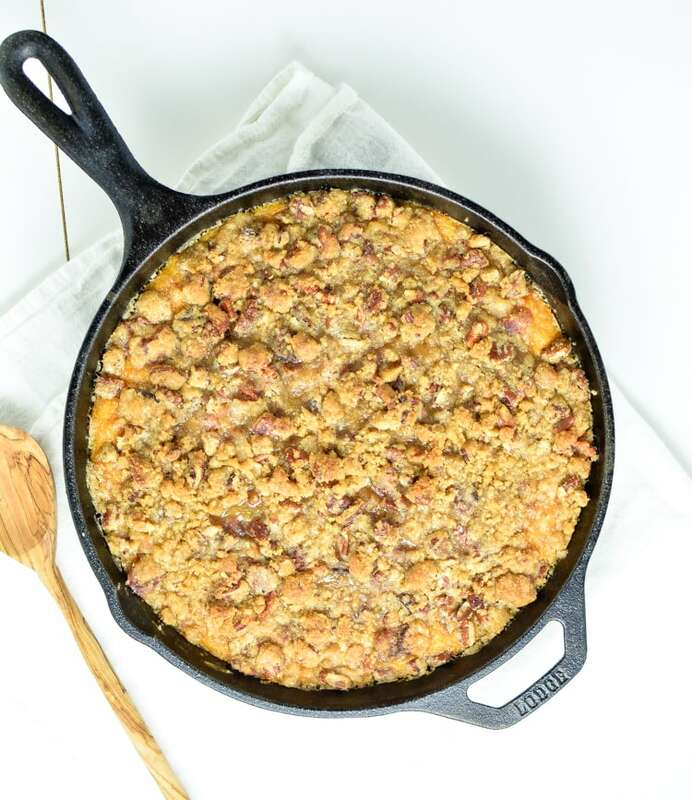 Add this skillet sweet potato casserole to your Thanksgiving day menus! I know I will be! Have a wonderful weekend everyone, and I’ll talk to you next month! 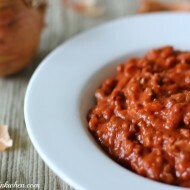 This sounds delicious Jen – definitely happening on our dinner table soon! Sounds great to me! Thanks for linking up to Merry Monday! Sharing on Fb & Pinned ! Have a great week! Sounds great! Pinning this to try later.